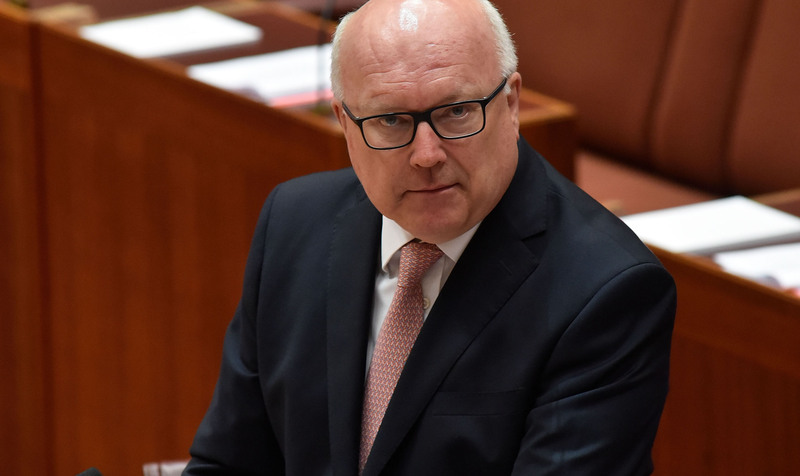 George Brandis might be on the way out of parliament and bound for London, but his future is still very much hostage to the political fortunes of Malcolm Turnbull. In years gone by, the former attorney general could ordinarily have expected to be happy and secure for at least three years in his new employment. Now, Brandis might be lucky with half that time. To explain why, a little recent history is needed. Brandis is the latest in a long line of Australian politicians to be dispatched as High Commissioner to the UK, and because this habit has been shared by both sides of politics, any former member of parliament appointed to a diplomatic post was regarded as almost sacrosanct. For the sake of simplicity, let’s call it the ‘Amanda Vanstone rule’. Vanstone, a former Liberal senator from South Australia, was sent to be Australia’s ambassador to Italy in 2007 just before the Howard government lost office. But her exception only served to prove the rule (much to the annoyance of many in Labor after Kevin Rudd won power), whereby once an ex-politician had made the transformation to diplomat, he or she was left alone to serve out a term, regardless of any change of political fortune back home. This is a very different tradition from the US foreign service, where political appointees resign from diplomatic posts after a change of president. There is still no American ambassador in Canberra, for example – and roughly 40 other places. The practice in Australia has been for political appointees to continue. Two other former Liberal senators in diplomatic jobs at the time Rudd took government - Richard Alston in London and Robert Hill at the UN in New York - also stayed on. The same rule applied to former Labor leader Kim Beazley, ambassador in Washington when Tony Abbott took power. Well, sort of. It was actually at about this point where the tradition that might have guaranteed George Brandis future job security started to unravel. Beazley’s term in Washington was extended in 2013, but some in Labor ranks saw this as a fig-leaf to disguise Coalition partisanship. In one of her first acts as Foreign Minister, Julie Bishop sacked former Labor premier Steve Bracks from his position as Australia’s consul general in New York (Bracks had begun consultations, but was yet to move to the US). Bishop defended her stance by claiming the Gillard government should have discussed the Bracks appointment with the Coalition ahead of the election. But her case wasn’t helped a few months later when she confirmed speculation from immediately after Bracks’ sacking that former Liberal powerbroker Nick Minchin would take up the New York role. An effort was made to restore the political etiquette. Bishop axed another Gillard-era appointment, former South Australian premier Mike Rann in the UK, but allowed Rann an unusual switch as a consolation prize, making him ambassador in Rome. Bishop then anointed former Liberal foreign minister Alexander Downer as Australia’s man in London. Murky and confusing? What else can be expected from the world of political favours, and a diplomatic posting is an enormous favour. There is a reason the media reaches for the cliché ‘plum’. A generous salary, taxpayer-funded living and transport in a worldly city are all tremendous perks. It is rare for an Australian politician to land in Harare (it has actually happened, once). The pace of political appointments to key diplomatic positions has accelerated in recent years, so much that the there is a good case to be made that Australia should adopt the US practice of having non-career diplomats resign with a change in government. This idea used to worry me as potentially destabilising for key relationships. But the trend is now strong enough that the convention should change to reflect the reality. By 2015, roughly one-in-ten of the head of mission positions across Australia’s diplomatic network was filled by a political appointment, a higher rate than any other time in the modern history of Australian diplomacy (in the US, the historical trend was roughly three-in-ten; for Donald Trump, so far, it’s closer to 60%). The number of political appointments for Australia peaked around the time former treasurer Joe Hockey went to Washington but has since dropped slightly, even after former Western Australian Liberal premier Richard Court was sent to Japan this year and Victorian Liberal Sharman Stone made ambassador for women and girls. But the problem for George Brandis is the political truce over diplomatic appointments looks to have ended. Labor has poked fun at Brandis about London rumours for well over a year. Even allowing that politics can make for strange bedfellows, it’s hard to imagine Bill Shorten would value Brandis’ views on Brexit should Labor win an election expected before May 2018. This is more than personal animus. Labor also accused Turnbull of breaking convention by not backing Kevin Rudd in his bid to become UN secretary-general (despite plenty of private resentment towards Rudd within the ALP). As prime minister, Rudd had supported Alexander Downer to become a UN special envoy mediating the Cyprus conflict, sent former Nationals’ leader Tim Fischer to represent Australia at the Vatican and former Liberal leader Brendan Nelson to Brussels. The favour was not returned. Brandis won’t be the last politician in a diplomatic job – it has not gone unnoticed that the head-of-mission position in Brussels has been sitting vacant for quite a while. But Brandis could begin a new rule in Australian diplomacy, and be ready to pack his bags and depart should the government change at home.